We are so lucky to live here on the Gold Coast as there is always somewhere beckoning to be explored. The Currumbin Valley and Tomewin Mountain was one of those areas that we had not got around to visiting. As we are experiencing absolutely glorious winter weather here at the moment we thought we would take the opportunity to head out for the day. The Currumbin Valley lays to the south-west of Surfers Paradise. You will need to travel south along the M1 before turning inland. The Valley is a deeply fertile area and dotted with many large acre lots. As you drive along the Currumbin Creek Road you will find a number of road side stalls selling fresh produce. These are always a favourite with us and a great way to stock up on fresh produce that is usually much cheaper than the supermarkets. If you follow Currumbin Creek Road all the way to the end you will enter the Mount Cougal Section of the Springbrook National Park. This section of the Springbrook National Park is almost right on the NSW border. It is another stunning spot that we can’t believe we hadn’t visited before. The walking track in to the Cascades is bituman and although Parks and Wildlife class this as an easy level track, I thought it was a little bit steep. They also always seem to under-estimate the length of the track. This one, according to my fitness tracker is around one kilometre each way. The Cascades in the Mt Cougal section of the Springbrook National Park are a very peaceful and pretty spot. However the walk is very worthwhile as the Cascades are beautiful. There are several spots where you can climb down onto the rocks around the Cascades, but as always, extreme caution should be used as these rocks can often be slippery and unstable. We also saw evidence of a recent land slip where a big chunk of the hill above us had washed away. At the far end of the walking track you will find the remnants of an old saw mill. It was established in the 1940’s as the Fruit and Vegetable Act 1927 deemed that bananas had to be packed in wooden crates. The farmer decided to mill his own timber and make his own boxes. 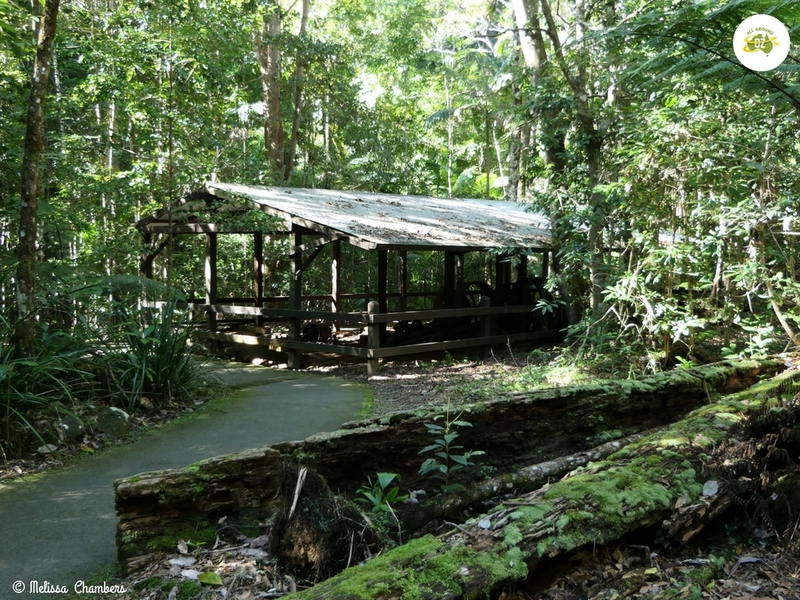 You will find the remnants of an old saw mill at the end of the Cascades walking track. Located just a few kilometres before the Cascades are the extremely popular Currumbin Rock Pools. This naturally formed water hole is in a section of Currumbin Creek. On a hot summers day it is packed with locals and visitors alike looking for somewhere to cool down. But on a sunny winters day there were just us day trippers there. There is a large grassed area perfect to throw a picnic rug out on. There are also covered picnic tables. Unfortunately, there are no barbecues or toilets at the moment due to a fire. Council have provided some port-a-loos as a temporary solution whilst the amenities are rebuilt. Across the road you will find a small art gallery and coffee shop that is worth checking out. 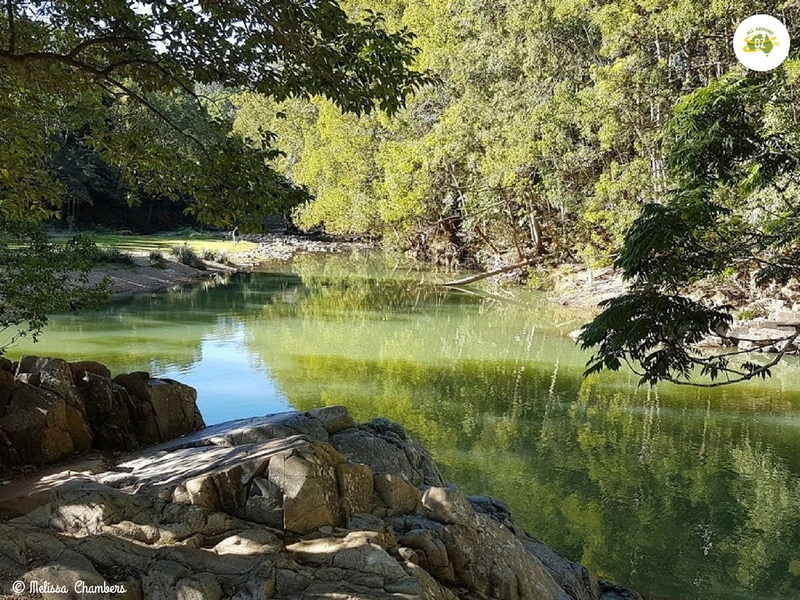 The Currumbin Rock Pools are the perfect spot to cool down on a hot summers day. Tomewin Mountain Road connects the Currumbin Valley with the Tweed Valley and is a pleasant drive along a fairly steep and windy road. In places it offers spectacular views back to the Coast and the Valley below. There are several spots along the road where you can pull over and take photos. The one spot you most definitely want to stop at though is Freemans Organic Farm. Freemans Organic Farm is a Tomewin Mountain icon. Established by the Freeman family in the 1900’s, Arthur Freeman was considered the pioneer of banana farming in Australia. 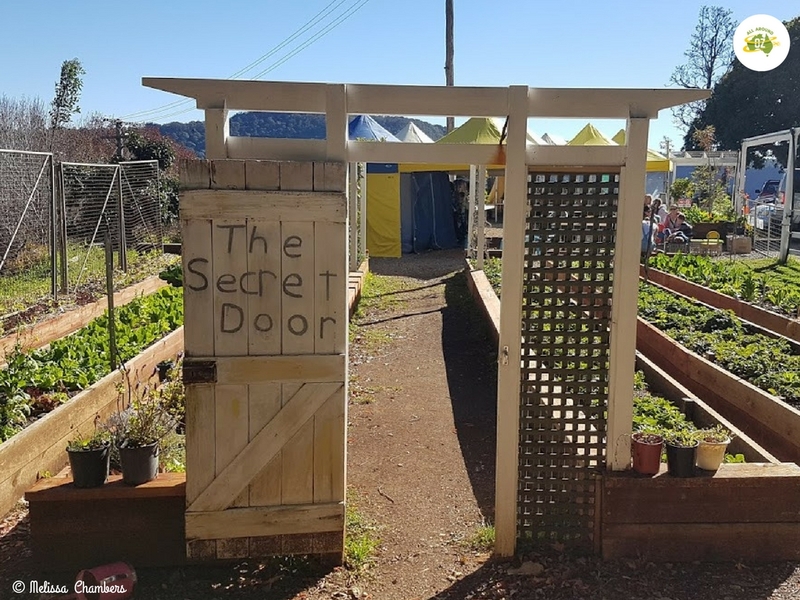 A stop here will see you being able to purchase a huge range of organically grown fruit and veg. In fact there are avocado trees growing right behind the vegie stall. There is also a beautiful cafe where you can have breakfast or coffee and cake. Adjacent to the cafe are rows of vegies including a huge strawberry patch. Kids are welcome to eat as many strawberries straight out of the garden as they can. And of course the views are spectacular! Situated almost on the top of Tomewin Mountain, you can see for miles down into the valley and over to the surrounding hills. There is plenty of seating available and a large grassed area perfect for an impromptu picnic. In general the whole area is really well set up to allow the kids to explore and play. The cafe is open Friday, Saturday and Sunday. The fruit and veg stall opens Friday, Saturday, Sunday and Monday. Farm tours are also available every Sunday. They cost just $15.00 and there is no need to book. Private tours and group tours can also be arranged by appointment. Freemans Organic Farm is a Tomewin Mountain icon and a great spot to stop for morning tea. Our last stop of the day was the quirky Red Rattlers Gallery. As you travel south along Tomewin Road you will cross the Queensland/NSW border and then drop down into the valley below. Here you will find the Red Rattlers Gallery which is just a 5 minute drive from Murwillumbah. 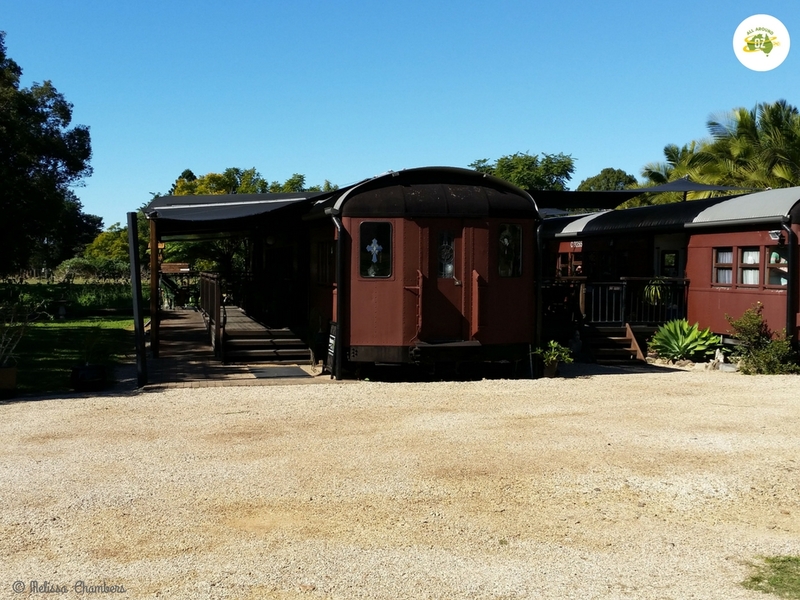 The Red Rattlers Gallery consists of two 1929 vintage Red Rattler train carriages. These have both been fully restored and now house an art and craft gallery as well as a coffee shop. A lovely, shady garden surrounds the first carriage and there is a deck area between the two carriages with tables made from slabs of timber. It was a really great spot to find and perfect to while away some time over a coffee or browse the eclectic collection of art and craft. The Red Rattlers Gallery is just a short drive from Murwillumbah and perfect for morning or afternoon tea. 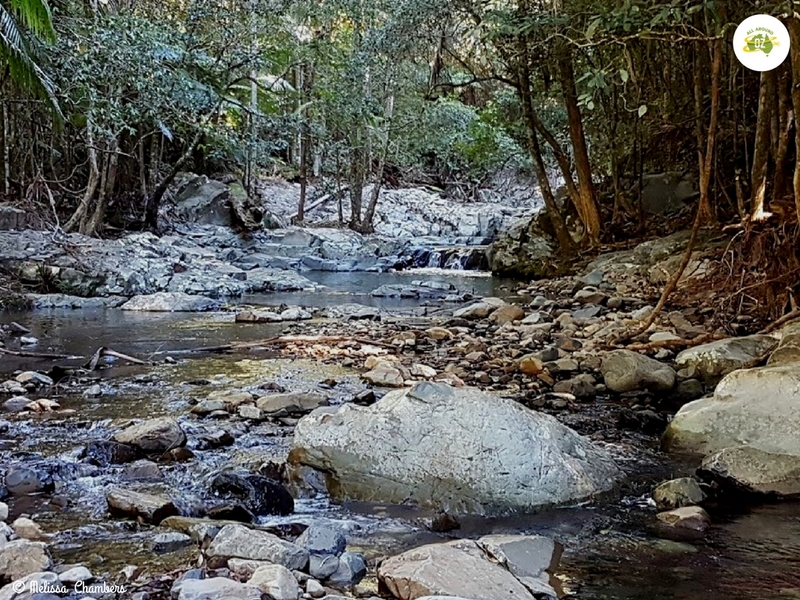 We had an awesome day exploring the Currumbin Valley and Tomewin Mountain and we think you will too. I’ve never explored the Gold Coast hinterland. Maybe now I’m on the Sunny Coast we can come down & do just that. Great idea Jo. So many gorgeous spots to visit and lots to do! Thanks for the share. Now have to organize a trip to Red Rattlers Gallery. Never knew about them. No we didn’t either. Very quirky idea and a lovely spot to stop. I have driven out to end of Currumbin Creek Road and taken the Cascades walk, but I haven’t driven Tomewin Mountain Road in years. Great idea! I will have to put this on our Sunday Drive list. Yes do it Kathy. We had such a lovely day out and was nice to explore a different area.